What do elephants going to China have to do with great ape trafficking? A story broke a few days ago reporting that more than 30 baby elephants had been captured from their mothers in Zimbabwe’s Hwange National Park, destined for China. A subsequent story reported that a Zimbabwean government spokesperson stated that the elephants were bound for the United Arab Emirates, which was confirmed by the UAE; they aim to import seven elephants for an unnamed facility. But PEGAS has obtained reliable information that a zoo in Guangzhou, China, intends to import 50 elephants from Zimbabwe. In preparation, the government hired a conservation consulting firm to prepare a study entitled “Guidelines for Translocation of African Elephants”. The study recommended that no wild, young elephants be transported, but those concerned should monitor the situation closely to see what actually happens. This is a repeat on a larger scale of a story that broke in early 2013 about baby elephants going to China. A few elephants actually were shipped, arriving in November 2012, where one died soon after arrival at the Taiyuan Zoo in freezing weather. The CITES Trade Database reports that eight live elephants were imported by China from Zimbabwe that year. Further shipments were temporarily stopped after campaigns were launched by the Zimbabwe Conservation Task Force and Born Free-UK. Since 2000, the CITES Trade Database indicates that China has imported 54 live African elephants, most of them from South Africa and Tanzania, so this practice is nothing new. 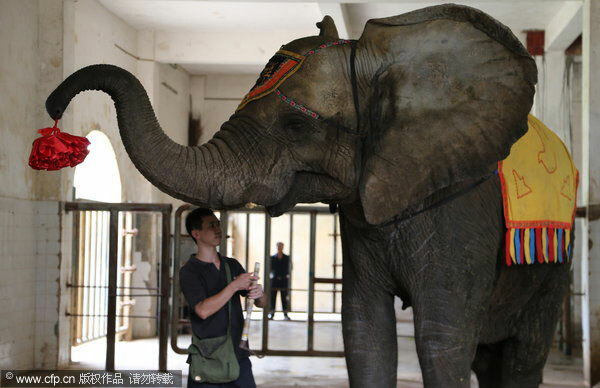 PEGAS conducted an extensive Google search, and could only find mention of three African elephants in China, two females at the Nanning Zoo and one male at Beijing Zoo. Either all those imported died, or they are only written about in Chinese, or not at all. 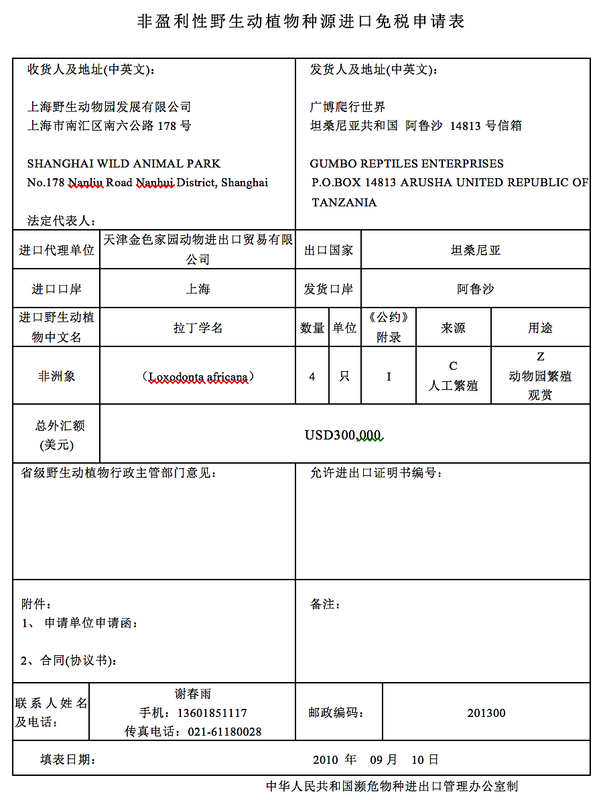 (Click to enlarge) A Chinese translation of an English-language CITES trade permit indicating that the Shanghai Wild Animal Park imported 4 elephants from Tanzania. The relevance this case has for great apes is that African elephants and apes are sent to the same facilities in China using similar abuses of the CITES trade permit system. In 2011 China imported 7 elephants from Tanzania, according to the CITES Trade Database. 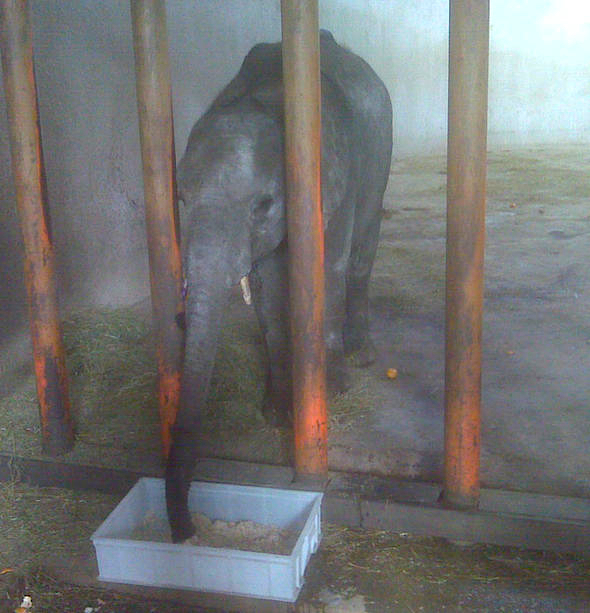 PEGAS has obtained a copy of a Chinese translation of the CITES export permit used to send 4 elephants from Tanzania to the Shanghai Wild Animal Park (see picture at left). The date of the permit is September 2010, and since permits have a six-month period of validity these four may have made up part of the 7 reported in 2011. 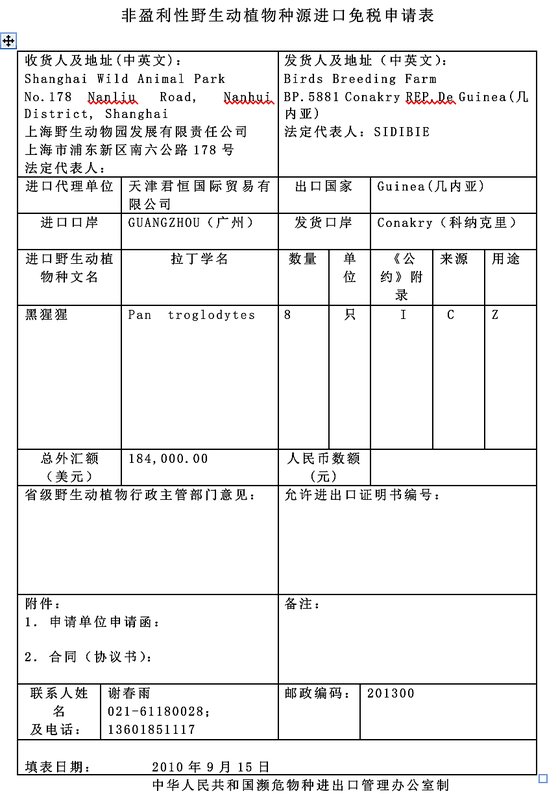 (Click to enlarge) A copy of a CITES trade permit for 8 chimpanzees sent from Guinea to the Shanghai Wild Animal Park. In the same month, the Shanghai Wild Animal Park was also indicated on a CITES trade permit as the destination for 8 chimpanzees exported by Guinea (see picture at right). Note on both permits the two boxes next to each other containing a C and a Z. The C source code signifies that the animals were at least second generation bred in captivity and that the purpose Z is a zoo. The Guinea permits are known to be fraudulent, as it has no breeding facilities of any kind, and CITES sanctioned the country in 2013 with a commercial trade ban. China was cleared of any wrongdoing by CITES, a gross miscarriage of justice in the eyes of many observers (see The Story of the Shanghai Eight for details). The CITES Trade Database does not report any elephants imported by China with a C source code. However, an Appendix I specimen with a C source code is treated as an Appendix II specimen by CITES regulations, which requires no import permit. The Chinese language permit above, therefore, is probably a translation of the Tanzanian export permit. In any case, Tanzania has no breeding facility for elephants, so the permit is fraudulent in the same way that the Guinea chimpanzee permits were. CITES should investigate to establish the truth of the matter. The Shanghai Wild Animal Park is not a zoo as defined by any credible zoo association such as the World Association of Zoos and Aquariums (WAZA) or the European Association of Zoos and Aquaria (EAZA), and in fact is not accredited by any zoo association. 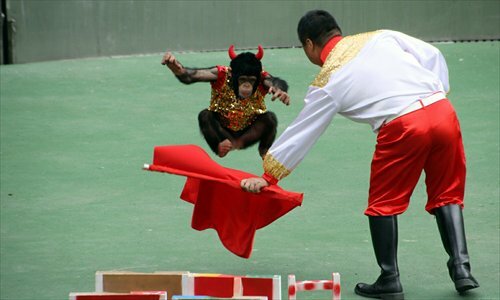 The facility is a commercial amusement park that trains the animals for use in circus performances. This is possibly what awaits the elephants from Zimbabwe destined for Guangzhou, which has two enormous safari park type “zoos”, the Chimelong complex and the Guangzhou Zoo. Both of these parks use great apes in commercial performances in contravention of CITES regulations, but CITES has taken no action on the practice. Zimbabwe and China must be compelled to disclose transparently the details of where the elephants are destined and for what purpose they are intended. They should also make public the CITES import and export permits – we already know that the elephants were not bred in captivity, and they were stolen from their mothers. Appendix I African elephants captured from the wild cannot be used for commercial purposes. Common sense would indicate that a multi-million dollar deal involving 50 elephants could be nothing else but commercial. Will the CITES Secretariat guide appropriate action, or will it maintain its usual pose when China is involved? 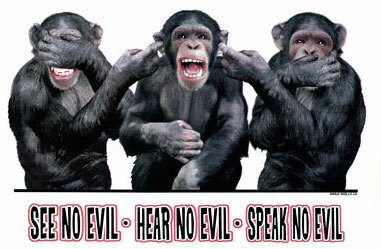 In the issue of illegal imports of chimpanzees to China, the CITES Secretariat has seen, heard or spoken no evil concerning the country. Will it be the same for African elephants? The CITES Secretariat has issued a statement that clarifies some aspects of the news reports that baby elephants have been captured in Zimbabwe for export to the UAE and/or China, but adds a new element that contributes to the muddle. It appears that Zimbabwe is perfectly within its legal rights to export live elephants, as elephants in the country are listed in Appendix II, which allows restricted trade. As long as the elephants are transported humanely in accordance with the Live Animals Regulations of the International Air Transport Association (IATA), and they are traded to “appropriate and acceptable destinations”, the trade is allowable. “Appropriate and acceptable destinations” is defined in Resolution Conf. 11.20 of the Conference of the Parties to CITES. Much of this information was released in 2013 when the 2012 elephant exports from Zimbabwe to China came to light. The new muddle is that the UAE claims that it is importing “seven elephants as a family group that has been in captivity in Zimbabwe for more than 10 years.” So where does this leave the captured babies allegedly held in a stockade in Hwange National Park? Could they still be destined for China? News reports have linked Hank Jenkins, an Australian, with the elephant exports to China. PEGAS has obtained personal email correspondence from Jenkins stating that he is not involved with the current elephant captures. The press reports were also inaccurate in describing Jenkins as “a former top official from Cites”. The CITES Secretariat stated that “He was never an official of the CITES Secretariat and has no association with the Secretariat.” It seems that we cannot believe everything we read in the press. Jenkins’ disassociation with the current elephant brouhaha, however, does not mean that he will not be involved in future elephant exports from Zimbabwe to China. For those (like PEGAS) who believe that wild animals should not be put in captivity for use to entertain humans, the only legal recourse to stop the exports would be to demonstrate that they were not headed to “appropriate and acceptable destinations”. (The transport angle would only be temporary.) That is difficult to do without knowing the destination. CITES defines the term “to mean destinations where the Scientific Authority of the State of import is satisfied that the proposed recipient of a living specimen is suitably equipped to house and care for it.” The Secretariat described it as a “private park”. That eliminates public zoos, but there are many private parks and zoos in oil-rich UAE. The purchaser should allow an independent inspection of the facility to verify that it is appropriate for seven African elephants, and to pledge that they will not be used for commercial purposes. Investigations should also be carried out to verify that the seven elephants have indeed been in captivity for ten years. To return to great apes, there are no Appendix II apes in Africa. Any export of them currently (or in the recent past) would be illegal. PEGAS saw great apes in captivity in a recent visit to the UAE, and media stories have reported them in private collections. We will continue investigations as to how they got there, resources allowing. If any are demonstrated to be the result of illegal trade, PEGAS will campaign to have them confiscated and repatriated to their country of origin or, if unknown, to an appropriate facility such as a sanctuary. This entry was posted in China, CITES, PEGAS, Southern Africa, Zimbabwe and tagged China, CITES, PEGAS, Southern Africa, Zimbabwe. Bookmark the permalink. This is INSANE! ! Well elephants. .. or ANY other animals, ate NOT HERE FOR OUR ENTERTAINMENT! !! To rip these babies right from their mothers is just plain evil! These babies NEED their mothers fir YEARS, not to Mentone their entire families, plus the other herds for socialization. To even say that there are “plenty of elephants” there, as a “reason” (excuse) to make it “ok” in the minds of these Africans, to think it’s ok to capture and transport and SELF them to China, of all places, where the “train” these innocent poor baby ellies fir CIRCUS is just APPALING! The intense abuse these elephants endure in the “entertainment” businesses is plain horrifying! PLEASE. .. LEAVE THESE BABIES ALONE IN THE WILD WITH THEIR FAMILIES ETHER THEY BELONG! PLEASE PREVENT MORE SUFFERING!